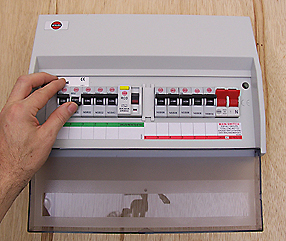 Your house wiring is protected either by fuses or circuit breakers depending on the type you have. Why do fuses/circuit breakers fail?  The circuit is overloaded so that it is trying to draw too much current.  There is a fault on the circuit probably creating a short (short circuit) caused possibly by the live touching neutral or earth wires, or possibly a fault on an appliance. When a fuse blows are a breaker trips It may be from a temporary problem so you can try changing the fuse (or fuse wire) or reset the breaker. If it then blows/trips again you still have a fault. Unless there is an obvious solution you should call a qualified electrician. See also my section on fault finding. E.g. Sometimes when a light bulb fails it also trips the breaker and simply resetting the breaker will solve the problem. 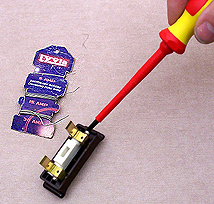 Feed the new fuse wire through the white ceramic holder. Unscrew the two retaining screws and secure the new wire at both ends. Simply flip the breaker back to the on position. If it won't re-set you still have a fault.